Is peace finally in the air for Colombian civil society? March 25 2016: After 60 years of conflict, civil society in Colombia is beginning to take its peacebuilding task seriously. Lina Jaramillo reports on an innovative award that is encouraging local approaches to peace. To build a peaceful society after 60 years of conflict is one Colombia’s biggest challenges. 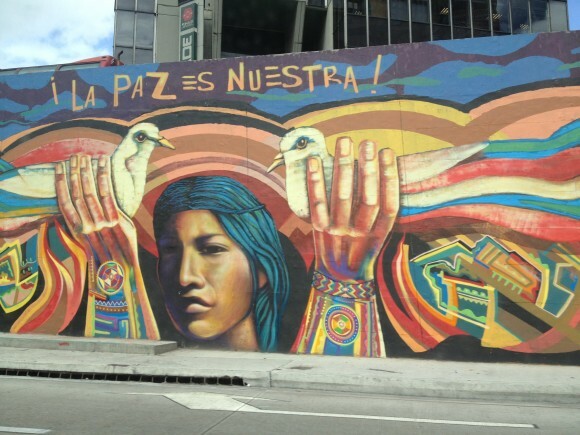 With the promise of a peace agreement still up in the air, Colombian civil society is getting ready for its biggest challenge yet: to build a peaceful society after 60 years of armed conflict. 60 years of conflict means that nearly two generations do not know how to live without war. Nevertheless, behind this sad reality, plenty of peace initiatives around the country have been developed – even before the peace negotiations began. For many of them, though, their work was not noticeable enough.Nowadays it seems this is changing. Peacebuilding is a trending topic, and different sectors of civil society are promoting and publicising a huge variety of innovative initiatives that encourage reconciliation, coexistence, forgiveness and cultures of peace. This is the main objective of RECON Paz en Movimiento, a peacebuilding award developed by a national organisation of regional envoys called FENALPER. Through RECON, peacebuilders are given the opportunity to showcase their initiatives and projects so regular citizens can choose the best peace initiatives. The award process for this year was opened on 17 March and more than 400 initiatives from different regions applied. In order to be part of the pre-selection stage, RECON organisers identified assessment requirements such as sustainability, social impact, creativity, innovation and replicability. After this pre-assessment stage, the organisers will select five peace initiatives classified in specific categories: Cultural arts and sport practices, Environment, Education, Technologies and Communication, Entrepreneurship and Income Generation. The voting process began on 21 March and will be open until 2 April. The three most voted-for initiatives in each category will be nominated and by 8 April, an outstanding board will choose the best five initiatives – one in each category. The winners will each receive $1,600 as seed funding to support their activities. It is one of the first attempts to enhance civil society efforts that are thinking about Colombia not as a war state, but as a peaceful nation. Beyond the technical aspects related to this award, the RECON initiative is quite remarkable. It is one of the first attempts to enhance civil society efforts that are thinking about Colombia not as a warring state, but as a peaceful nation. One of the most difficult tasks about the reconciliation process is rethinking our society and changing all the ideas and biases that have ruled our violent history.Furthermore, the RECON award has been supported by social media, private sector, the Swedish Embassy, the British Embassy, local authorities, and different civil society organisations, among others. This is a significant example of how peacebuilding issues are becoming more and more relevant for Colombian society. Different alliances and synergies have been created in order to prioritise peace work at the regional and local levels. Hopefully RECON will be just one of many successful attempts to empower people and groups that have been running post-conflict activities for decades, even in the middle of the armed conflict. Definitely, a mood of peacebuilding is in the air.